OTA Environmental offers OOOOa LDAR services. 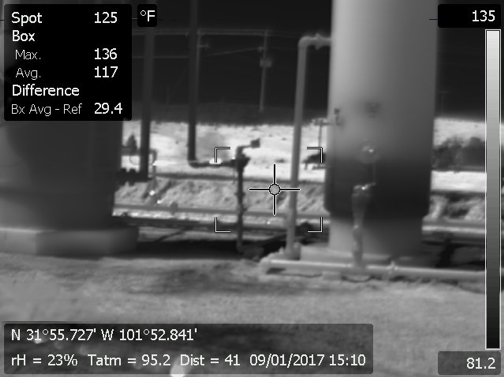 All of our Optical Gas Imaging camera operators are certified by the Infrared Training Center (ITC). They are trained to provide guidance for leak prevention and trained to complete leak related repairs. 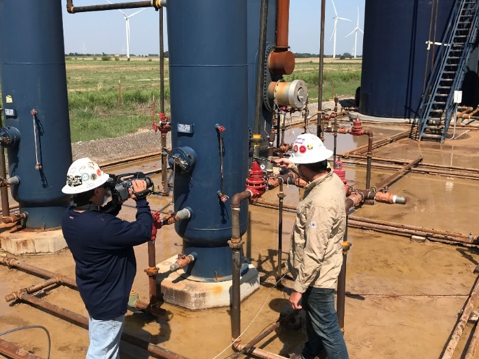 OTA’s Certified OGI camera operators conduct LDAR surveys of oil and natural gas well sites and compressor station sites. They gather the required data during the survey that will be included in the LDAR report. These reports are generated for facilities that are affected and regulated under the Federal Regulation 40 CFR Part 60 Subpart OOOOa. We assist our clients in their annual submission of these reports to the EPA and state regulatory agencies. HOW DO I DETERMINE IF THE COLLECTION OF FUGITIVE EMISSIONS COMPONENTS AT MY SITE IS AN AFFECTED FACILITY? 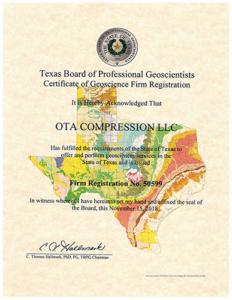 If you own or operate a crude oil or natural gas well site or a compressor station for which you commence construction, modification, or reconstruction after September 18, 2015, then you have an affected facility and are subject to OOOOa regulations. A well site is one or more surface sites that are constructed for the drilling and subsequent operation of any oil well, natural gas well, or injection well. This includes a separate tank battery surface site collecting crude oil, condensate, intermediate hydrocarbon liquids, or produced water from wells not located at the well site (e.g., centralized tank batteries). A modification occurs when either: a new well is drilled at your existing well site, a well at your existing well site is hydraulically fractured, or a well at your existing well site is hydraulically re-fractured. A compressor station is a site that has any permanent combination of one or more compressors that move natural gas at an increased pressure through gathering or transmission pipelines, or into or out of storage. The compressor stations are typically called “gathering and boosting,” “transmission” or “storage” compressor stations. A modification to your compressor station occurs when an additional compressor is installed at the compressor station or when one or more compressors are replaced by compressors with a greater horsepower. If one or more compressors are replaced with compressors with equal or less horsepower, then installation of the compressors does not trigger a modification. You are not subject to the requirements in subpart OOOOa if the well site contains only one or more wellheads (i.e., the well site does not have any equipment associated with the wellheads such as separators, compressors, heaters, or dehydrators). 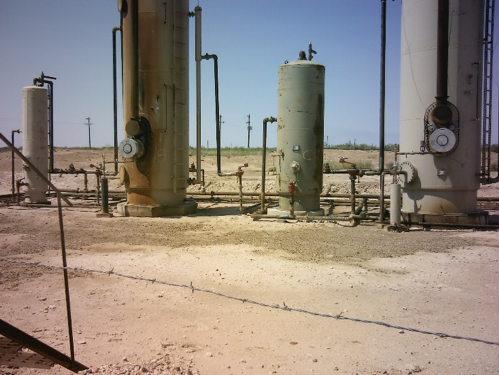 The affected facility status of a separate tank battery surface site has no effect on the affected facility status of a well site that only contains one or more wellheads. Therefore, if you add a new well, hydraulically fracture or re-fractured a well at your well site after September 18, 2015, you are now subject to the fugitive monitoring requirements in subpart OOOOa. The combination of one or more compressors at a well site or located at an onshore natural gas processing plant is not a compressor station for purposes of the fugitive emission requirements. You must reduce greenhouse gas emissions (in the form of a limitation on emissions of methane) and volatile organic compound emissions from the collection of fugitive emissions components at a well site or compressor station. You must have your monitoring plan for each company-defined area in place and perform the initial monitoring survey within 60 days of the startup of production for new, modified, or reconstructed well sites or within 60 days of the startup of a new, modified or reconstructed compressor station or by June 3, 2017, whichever is later. For well sites, subsequent monitoring surveys must be performed semi-annually after the initial survey. The semiannual surveys must be performed at least four (4) months apart. You must repair or replace each identified leaking fugitive emission component as soon as practicable, but no later than 30 calendar days after detection of the fugitive emission. You must resurvey each repaired fugitive emission component as soon as practicable after repair, but not later than 30 days after repair has been completed. You must submit your initial annual report within 90 days of the end of the initial compliance period which begins August 2, 2016 or upon startup, whichever is later, and ends no later than one year after the initial startup date or no later than August 2, 2017.